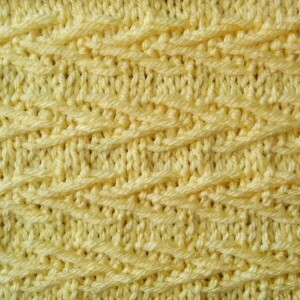 The Chevron stitch is a unique stitch which better resembles traditional weaving than it does knitting. The slipped stitches create chevron patterns throughout the entire project. Knitted in a multiple of 10 stitches plus 2 and a 26-row repeat. Don’t let the 26 rows intimidate you, this pattern is guaranteed to knit up faster than you think! The one-of-a-kind look of the Chevron stitch is sure to add extra character to your knitting project. Like the Chevron stitch? Check out the Linen Chevron Cowl! Row 1 (RS): k1, *k2, sl 3 wyif; rep from * to the last st, k1. Row 2: p1,*p1, sl 3 wyib, p1; rep from * to the last st, p1. Row 3: k1, *sl 3 wyif, k2; rep from * to the last stitch, k1. Row 4: p1, *sl 1 wyib, p2, sl 3 wyib, p2, sl 2 wyib; rep from * to the last st, p1. Row 5: k1, *sl 1 wyif, k2, sl 3 wyif, k2, sl 2 wyif; rep from * to the last st, k1. Row 6: p1, *sl 3 wyib, p2; rep from * to last st, p1. Row 14: p1, *sl 3 wyib, p2; rep from * to last st, p1. Row 15: k1, *sl 1 wyif, k2, sl 3 wyif, k2, sl 2 wyif; rep from * to the last st, k1. Row 16: p1, *sl 1 wyib, p2, sl 3 wyib, p2, sl 2 wyib; rep from * to the last st, p1. Row 17: k1, *sl 3 wyif, k2; rep from * to the last stitch, k1. Row 18: p1,*p1, sl 3 wyib, p1; rep from * to the last st, p1. Row 19: k1, *k2, sl 3 wyif; rep from * to the last st, k1. Row 20: repeat Rd 18. Row 21: repeat Rd 17. Row 22: repeat Rd 16. Row 23: repeat Rd 15. Row 24: repeat Rd 14. What’s the difference between the patterns for Chevron and the Linen cowls? I have a very fine lace yarn that is looking for a classy cowl and done with small needles ’cause the human enjoys fine work.